The government has rejected calls by the UK's four child commissioners to introduce laws banning the smacking of children, saying parents should decide. In a letter to Education Secretary Ruth Kelly the four said a law change was a matter of "fundamental principle". Legislation which was tightened last year allows parents to hit their child mildly as a "reasonable punishment". The Department for Education and Skills stressed it did not condone physical punishment for children. In a statement the department said it was for parents to decide, adding: "They have to think carefully about the law on assault and make sure that chastisement does not get to that point. If not they will be prosecuted." Prime Minister Tony Blair has admitted smacking his older children. 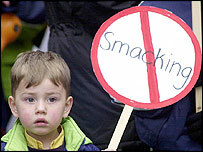 Other campaigners say smacking should not be confused with child abuse. Kathleen Marshall, Scotland's Commissioner for Children and Young People, told the BBC that the UK was failing to meet its obligations. "We must insist on a total ban because this isn't an issue that's going to go away," she said. "The smacking of children, the hitting of children in what in Scotland is called 'justifiable assault' is prohibited by international law. "The United Nations and the council of Europe have both made it very clear that all physical punishment, all assaults on children, must be made illegal, and so we would be failing in our duty as children's commissioners if we did not say that we have to keep this on the agenda." The government's stance is backed by some, including Mike Judge of the Christian Institute. He said: 'I think the law as it stands is perfectly reasonable. It is fair enough to protect parents and firm enough to protect children and there's been no evidence that the current law is a problem." But the Children's Right's Alliance told BBC Radio 5 Live's Stephen Nolan Show that any form of physical punishment is wrong. Spokeswoman Caroline Willow said: "If you look at it from adults we have special words like slap and tap and smack, which disguise the violence that's being inflicted on children. "If you ask children themselves, which I've done, children are very clear that smacking is hitting, and that it hurts and that parents regret it and there's better ways to deal with situations." The BBC's Laura Bundock said the commissioners' statement proposed that "children are given the same protection from assault as an adult". "They argue smacking confuses parents, inhibits child protection and undermines the promotion of positive forms of discipline." She added: "With increasing bans in European countries, the UK law could well face similar changes." However, Mary Russell, from the Family Education Trust, told the BBC it was wrong to confuse the imposition of discipline with violence inflicted upon children. "Reasonable chastisement" is a defence against common assault but any punishment which causes visible bruising, grazes, scratches, minor swellings or cuts can result in legal action. In 2002, the United Nations' Committee on the Rights of the Child said it "deeply regrets that the (UK) persists in retaining the defence of 'reasonable chastisement'. In 2003, the Scottish Parliament voted to restrict the scope of "reasonable chastisement" by setting out criteria for determining whether an assault on a child was "justifiable". One year ago MPs voted to restrict "reasonable punishment" in England and Wales.